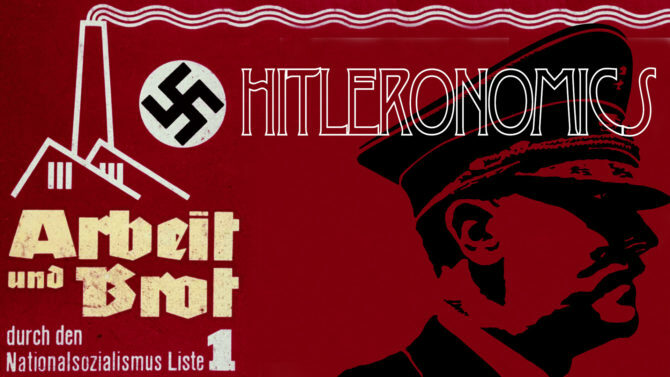 The so called ‘good Hitler years’ in the mid to late 1930s still persist as a myth, but at closer scrutiny the myth falls apart. In extremely simplified terms his economic policies were based on the idea of growth through conquest (increasing ‘Lebensraum’ for the German nation). To perform this conquest he needed growth of the economy and increased resources, which could only be won by conquest. That’s a circular self referencing system that cannot work. German growth in the 1930s was not extraordinary compared to other western countries – in fact it was slightly below European averages. The only way you can see it as being great is if you compare it to the dismal years of hyperinflation in the twenties, and the short term dip of the German economy after the 1929 crash. The delta between the years before Hitler came to power to after might be huge, but compared to normalcy it is not extraordinary. Moreover, as growth was starting from a heavily contracted economy after the crash, growth in real numbers was not as impressive as the percentile growth should indicate. As we shall see, this was growth created artificially in preparation for conquest of resources and economic might. It is specifically here that the catch 22 of needing growth to conquer to create growth negates any possible positive effects. As you can see from the chart, Hitler didn’t create growth in GDP that was any higher than a previous ‘normal year’ post WWI like 1927. Before 1927 reparations were still impacting the German economy and as of 1929 the depression pulled it down. As you can see there’s a big rally in 1933, the year Hitler seizes power, but that year the whole world economy was recovering, so this was pretty much average growth that cannot be attributable to any special economic policy. More importantly as economic policy takes time to have any measurable effect on the economy, any growth in 1933 cannot be attributed to Hitler and the Nazis. At the end of the chart you can also see how the need for large scale conquest to grow is becoming apparent in 1937 and 1938. Technically these years should automatically be higher growth years as the economy grows through Anschluss of Austria and the annexation of parts of Czechoslovakia. Instead we see a slowing GDP growth, which indicates that without annexation the picture would be grimmer. 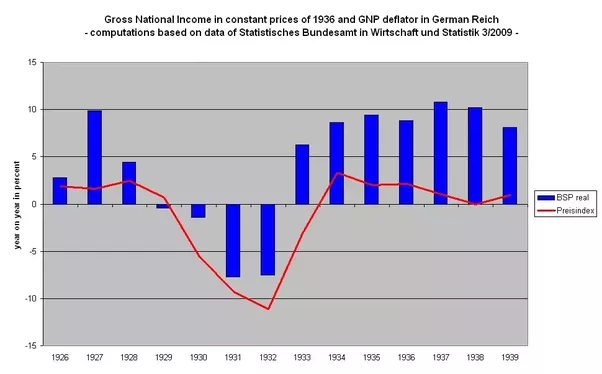 One of the reasons that the myth of the good Hitler years has persisted despite these indicators is that the subjective standard of living for Germans (those acceptable as Germans according to the Nazis) increased in this time. To finance their popular economic programs they imposed heavy taxation on corporate gains, sometimes even taxing gross revenue instead of profits in industries that they didn’t consider valuable to the Nazi ideology. They then used this money to feed it back into the economy with vast social security programs, infrastructure projects and military spending creating an inflated growth situation and a bubble that had to burst at some point. In parallel they faced increasing sanctions and restrictions on trade by the democratic western powers. To fix this they created a kind of extended isolationism by reducing their trading partners to friendly states in order to avoid the impact of said sanctions, and falling resource and goods prices in the world. Last but not least they artificially pushed up national income by inflating prices within that closed circuit trade system. Again, the international trade system they implemented was not sustainable, especially as it required these limited ‘trade partners’ to be extended at some point and this in turn left them with no other way than conquest. There is another myth that needs to address – this one to the Nazis advantage – Although the Nazi economy was an unsustainable and useless system, it is a widely spread misconception that the Nazis created growth by increasing the German budget deficit and the borrowing their way out of it. In fact the Nazis didn’t build a huge deficit at all as they managed to offset state spending by artificially increasing state income. So in effect the Nazis decreased the national budget deficit, albeit shortsightedly. So what about all the money they stole? Couldn’t that be the reason for the ‘good Hitler years’ at least for those who weren’t robbed? Well no, because although the Nazis systematically plundered people they prosecuted and murdered – in Germany alone they confiscated more than a year worth of GDP from the German Jews (120 Billion Reichsmark) – this is redistribution of wealth in a very nasty way and redistribution doesn’t create growth, it just moves money around. Moreover, incarcerating these people, or murdering them took them out of the productive economy so that any effect redistribution could have had was nullified. As they started gobbling up nations, they did use slavery and forced labour to offset this effect, but this too was short sighted and fairly uneconomic. In the end we must not forget that the reason for prosecution and murder of ‘undesirables’ was not financial, but ideological. The bigger financial reason for conquest was another one. It was the natural resources and forced trade partnering that was the goal – the plunder they performed was largely in the form of thwarting the national production of occupied territories to work for German interests – for example; Norway lost 20-40% of its annual economy to Germany during occupation – but his too was a lossy effort that didn’t produce the desired results and instead contributed to slowing down the German war machine. So already before the war broke out the Nazi economic bubble was set to burst under the weight of waging a war they couldn’t really afford.